I've been having lots of fun in the past few days. On Thursday the local Brazilian percussion Batteria performed on Pearl St. It was fun to watch and hear. Friday Andrew and I went to hear the great Ari Hoenig play drums at Dazzle in Denver. He's got a very unique sound and you can instantly see why he is a bandleader on the drum set. 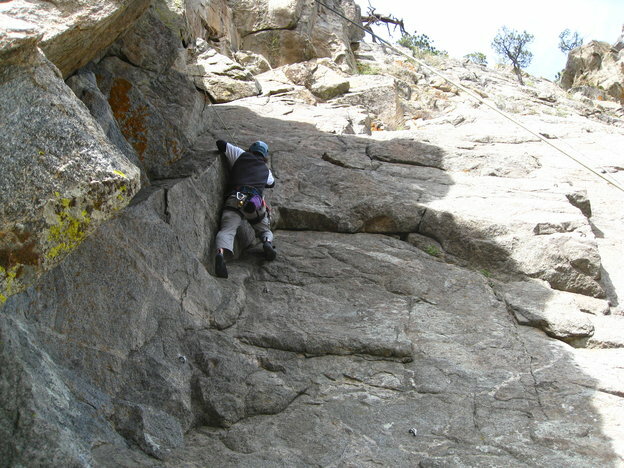 Today I went and climbed bihedral up in Boulder Canyon with a crew of about seven climbers. It was only my second time climbing outside and it was quite powerful. I can understand how surfers become mesmerized by the power of the ocean. Climbing in the gym is lots of fun and you think about technique and so forth, but climbing outside on a real massive, immovable, unforgiving mountain is just immensely humbling. I was definitely very nervous for the first climb or two and then settled into it a bit. But we did some really fun routes and when you're way up above the ground clinging to the side of a giant rock, you definitely feel put in your (small, temporary) place. We did have some near misses with falling rock and a few minor scrapes and cuts, but otherwise things went OK. Definitely glad I have a helmet now so I don't get knocked out by a falling rock while belaying someone who is sixty feet off the ground. More Spring 2009 photos are here . You might find this hard to believe, but I also managed to have two more house purchases fall through in failure. Sigh. It's basically back to the drawing board. I certainly learned a bit more about the whole negotiation process.